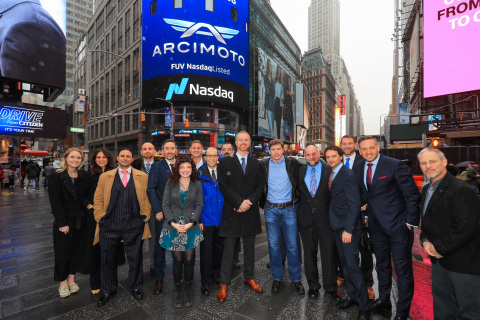 The Arcimoto (NASDAQ: FUV) management team commemorates ringing the Nasdaq Closing Bell on April 3, 2018 in Times Square, New York. Photography by Kelsey Ayres/Nasdaq, Inc.
EUGENE, Ore.--(BUSINESS WIRE)--Arcimoto, Inc.® (NASDAQ: FUV) — makers of the Fun Utility Vehicle® (FUV®) — an affordable, practical, and thrilling pure electric vehicle for everyday commuters and fleets, yesterday participated in a Closing Bell Ceremony from the Nasdaq MarketSite in Times Square to celebrate the six-month anniversary of the Company’s Reg A+ IPO and subsequent Nasdaq listing. Founder and President Mark Frohnmayer and a cadre of Arcimoto executives, investors and team members were present in the nationally televised event, which took place yesterday at 4:00 p.m. EDT in New York City. The event followed Arcimoto’s presence at the New York International Auto Show Press Days that took place at the Javits Center from March 28-29, 2018. Starting from a napkin sketch in 2007, Arcimoto’s decade-long journey to help catalyze the shift to a sustainable transportation system was celebrated by attendees at the Closing Bell Ceremony, where Arcimoto showcased the first-ever production Signature Series FUV to roll off the floor of the Arcimoto Manufacturing Plant. Arcimoto’s key focus areas for the remainder of the year are to finish delivery of its Signature Series FUVs, release fleets of Beta and Pilot Series vehicles, begin production and delivery of Retail Series FUVs to its more than 2,400 pre-order customers and launch its first in-market vehicle experience centers. This recent update from the Company showcases both Arcimoto’s accomplishments since its September 21, 2017 debut on NASDAQ, and how it is moving expeditiously towards significant vehicle production. Arcimoto executives will be attending the annual MicroCap Investor Conference on April 9-10, 2018 in New York City. Except for historical information, all of the statements, expectations, and assumptions contained in this press release are forward-looking statements. Forward-looking statements include, but are not limited to, statements that express our intentions, beliefs, expectations, strategies, predictions or any other statements relating to our future activities or other future events or conditions. These statements are based on current expectations, estimates and projections about our business based, in part, on assumptions made by management. These statements are not guarantees of future performance and involve risks, uncertainties and assumptions that are difficult to predict. Therefore, actual outcomes and results may, and are likely to, differ materially from what is expressed or forecasted in the forward-looking statements due to numerous factors discussed from time to time in documents which we file with the SEC. In addition, such statements could be affected by risks and uncertainties related to, among other things: our ability to effectively execute on our growth strategy; our ability to design, manufacture and market vehicle models within projected timeframes; the number of reservations and cancellations for our vehicles and the ability to deliver on those reservations; our reliance on key personnel; our ability to manage the distribution channels for our products, including our ability to successfully implement our direct to consumer distribution strategy and any additional distribution strategies we may deem appropriate; changes in consumer demand for, and acceptance of, our products; changes in the competitive environment, including adoption of technologies and products that compete with our products; the overall strength and stability of general economic conditions and of the automotive industry more specifically; and changes in laws or regulations governing our business and operations. Any forward-looking statements speak only as of the date on which they are made, and except as may be required under applicable securities laws, we do not undertake any obligation to update any forward-looking statements.